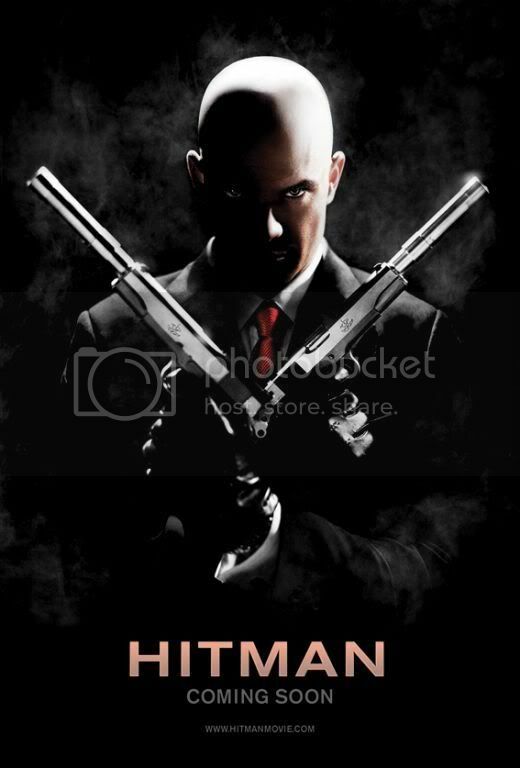 Here is the new Hitman Movie Poster. As you can see, it exhibits the same motif seen in the Hitman games with Agent 47's signature gun pose. I'm not really a fan of this game but I might check this out. Hitman is a 2007 film adaptation of the video game series Hitman. The film is directed by Xavier Gens and stars Timothy Olyphant. The script is written by Skip Woods. Hitman is scheduled for release on November 21, 2007. 20th Century Fox: "Agent 47 (Olyphant) has been educated, from his genetically-engineered "birth", to become a professional assassin for hire, whose most powerful weapons are his nerve and a resolute pride in his work. 47 is both the last two digits of the barcode tattooed on the back of his head and his only name. The hunter becomes the hunted when 47 gets caught up in a political takeover. Both Interpol and the Russian military chase the Hitman across Eastern Europe as he tries to find out who set him up and why they're trying to take him out of the game. But the greatest threat to 47's survival may be the stirrings of his conscience and the unfamiliar emotions aroused in him by a beautiful, damaged girl..."
Here are the other past Hitman Posters.